In case you missed the memo – October is breast cancer awareness month. Which means a giant influx of pink! 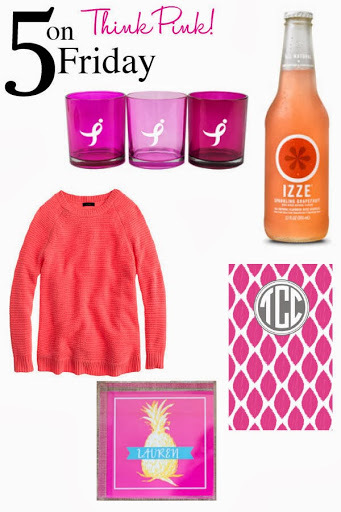 I’ve gathered five of my favorite pink items to show support for this great cause. Komen Candle Holders: These remind me of the candle I got when I was a part of Teens for the Cure in high school. Such a cute way to show your support & even better when you put a yummy smelling candle inside. IZZE Soda: I love IZZE! It comes in so many delicious flavors & I like to pretend it’s kind of good for you soda. J. Crew Sweater: The other great thing about October? Sweater weather! I love being able to pull out all my sweaters for fall, but this bright hue still brings a reminder of summer. MayDesigns Notebook: I love May Designs & their entire Think Pink collection donates to breast cancer awareness! Shopping for philanthropy – what could be better? Nico & Lala Acrylic Tray: I blame Psych for my obsession with pineapples. How cute is this acrylic tray? It would be a perfect catchall for keys, change, you name it! What are you favorite pink things for October?